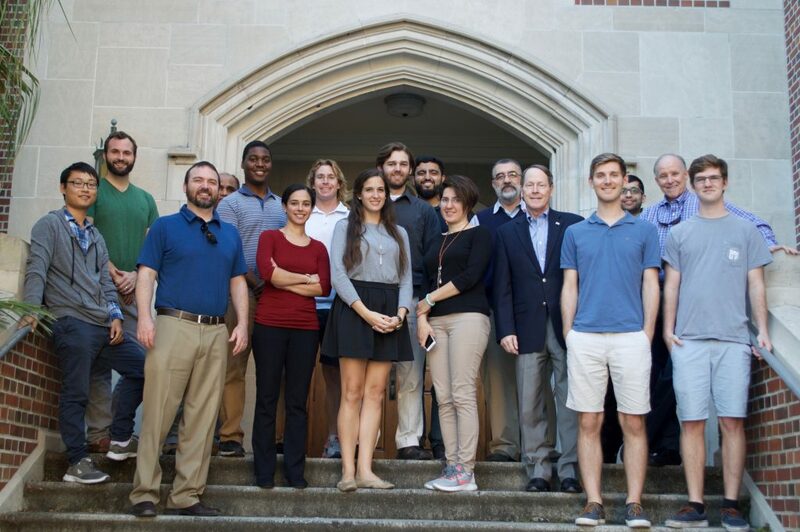 Fifteen students from the University of Florida earned the Certificate of Engineering Leadership and/or the Certificate of Engineering Entrepreneurship this semester. They make up the largest cohort of students to receive the certificates from the Herbert Wertheim College of Engineering. Glenn Renwick, retired CEO of Progressive Corporation, joined the congratulatory celebrations. As a past Linda Parker Hudson Engineering Leader in Residence and UF alumnus (M.S., ISE ’78), Renwick continues his involvement at UF, often guest lecturing in the engineering leadership and innovation courses. An engineer who started his career at Bell Labs, Renwick led Progressive, a world leader in insurance products and services, for 30 years before retiring in 2016. He continues to serve as executive chairman of the board. For the final presentations of the Fall 2017 Advanced Engineering Leadership Development course, Renwick served as the CEO of a fictional company. The student teams presented their plans to strategically and technically move the company forward using a culmination of their course material and leadership experience. The team presentations were also evaluated by the William H. Wadsworth Director of the Engineering Leadership Institute, Lt. Gen. (retired) Buster Hagenbeck; Engineering Professionalism and Ethics professor Claudio Spiguel; and Assistant Director of the Engineering Leadership Institute and course instructor, Bill McElroy. 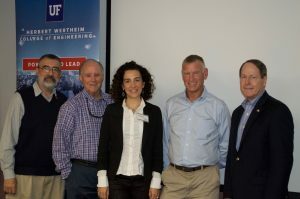 The Certificate of Engineering Leadership is offered by UF’s Engineering Leadership Institute, while the Certificate of Engineering Entrepreneurship is offered by UF’s Engineering Innovation Institute. Both are fundamental programs unique to UF and designed to train the New Engineer – engineers who are both technical and capable of leading and innovating for the future. Coursework for the certificate is developed with input from top industry, military and public leaders, to determine which skills and virtues are most critical in preparing for leadership roles in engineering careers.